How do we account for the failure of left working class movements taking root in most of Africa? The early 1950s witnessed an extraordinary sweep of popular mobilisations across the African continent inspired by aspirations for emancipatory freedom: an end to the colonial yoke. Nationalist parties convinced people that the path to freedom was through political independence. Since then, many of the gains of independence, which cost the blood and lives of millions in Africa, have been reversed with the privatisation of the commons and public utilities, as well as by dispossessions of land, by unemployment, and by the increasing costs of food, rent, and other necessities of life. In response, discontent has been growing across the continent, with spontaneous eruptions and mass uprisings that have in some cases resulted in the overthrow of regimes nurtured and nourished by imperialism (e.g. in Tunisia, Egypt, and Burkina Faso). In such circumstances, one would have thought that there would have been fertile grounds for the emergence of strong left working class movements across the continent. But why has this not happened? Left and communist parties of various sizes and influence have arisen in a number of countries across the continent over many decades, despite the terror of colonial repression that they faced. In many cases, the political strategy of these parties was to merge with the nationalist parties in the struggle for independence. This was in line with the prevailing dogma at the time: the ‘stagist’ view of revolution according to which communists were required not only to support the emergence of a national bourgeoisie as part of the ‘national democratic revolution,’ but to concede leadership to the nationalist movements–much as we have seen with the South African Communist Party yielding to the leadership of the ANC since 1994. On coming to power, most of the nationalist governments, often supported by the left, believed that all that was required to satisfy the demands of the masses was to take control of the state. But what they ignored was that the state was itself a colonial state, and set up to serve, protect and advance the interests of imperial power and its entourage of corporations and banks. That state had a monopoly over the use of violence. It had police forces, armies, and secret police and it used force and, where necessary, violence, to protect the interests of the way in which capitalism operated in the peripheries. 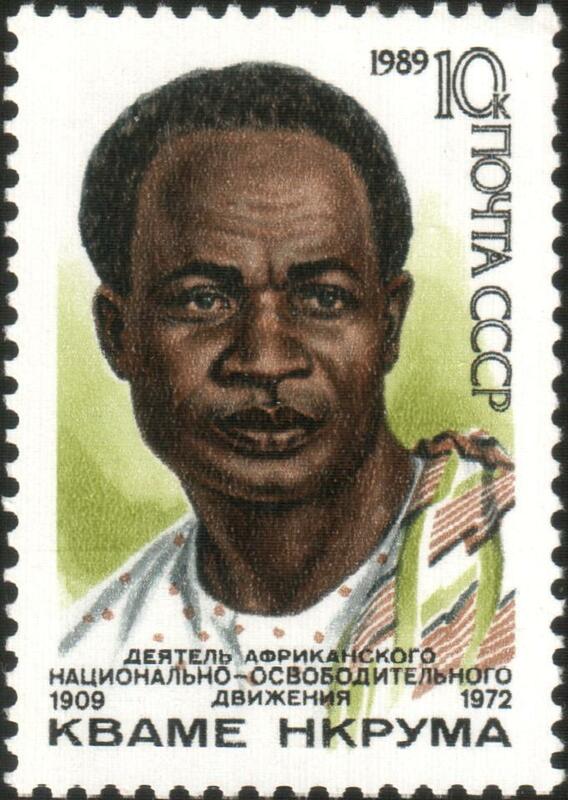 Russian Stamp: The 80th anniversary of the birth of K. Nkrumah (1909-1972). Source: Soviet Union Stamp Catalogue 1989. Having occupied the state, independence governments essentially sought to make modest reforms consisting primarily of deracialising the state and modernising it so that the economy could be more fully integrated with the new emerging international order that the US, Europe, and Japan set about creating after the Second World War. The structures of state control, the police, army, and special forces–even the structures and powers of native authority established by colonial powers–all these were left fundamentally intact, albeit dressed up in the colours of the national flag. The structures of the capitalist state were left intact, even where regimes proclaimed an adherence to ‘Marxism-Leninism’, as in Mengistu’s Ethiopia. Few understood the dangers of occupying, rather than creating alternatives to, the capitalist state. Amongst those must be counted Patrice Lumumba (Congo), Amilcar Cabral (Guinea-Bissau), and Tomas Sankara (Burkina Faso). They had in common their commitment to building alternatives to the colonial state. Cabral was emphatic: “It is our opinion that it is necessary to totally destroy, to break, to reduce to ash all aspects of the colonial state in our country in order to make everything possible for our people.” Tellingly, all three were assassinated by their own comrades, in collaboration with empire. While the repressive arms of the state may have been dressed in new uniforms, their role–that of protecting the interests of capitalism in the (former) colonies–remained unchanged. And as the emerging middle class and party officials who now occupied the neo-colonial state realised the potential for private accumulation and looting that access to the state provided, so their interest in transforming the state waned. ‘Africanisation’–or in South Africa’s case ‘Black Economic Empowerment’–was the battlecry of the emerging national bourgeoisie that would legitimise their access to sources of private accumulation. The growing presence of transnational corporations and international financial institutions, and the growing interest in ‘investing’ (principally in the extractive industries) provided too many lucrative opportunities for them to even consider making changes to economic power. The state became a honey-pot, and therefore frequently a terrain of conflict between different factions of the emerging class. In some cases, leading members of the left joined the ranks of the national bourgeoisie, just as we have seen in the case of Cyril Ramaphosa and others in South Africa. The national bourgeoisie discovers its historical mission: that of the intermediary. As we can see, its vocation is not to transform the nation but prosaically serve as a conveyor belt for capitalism, forced to camouflage itself behind the mask of neocolonialism. The national bourgeoisie, with no misgivings and with great pride, revels in the role of agent in its dealings with the Western bourgeoisie. This lucrative role, this function as small-time racketeer, this narrow-mindedness and lack of ambition are symptomatic of the incapacity of the national bourgeoisie to fulfil its historical role as a bourgeoisie. In fulfilling its function as an agent of the Western bourgeoisie and ‘as a small-time racketeer,’ this class turns upon the left that aided its path to power, and slaughters it, imprisons it, exiles it, or marginalises it. Slaughter was the case with one of the strongest communist parties in Sudan when, in 1971, Gaafar al-Nimiery launched a campaign that resulted in almost the total elimination of the party. Even where the organised left was not strong, the post-independence period witnessed assassinations of radicals: for example in Kenya with the assassinations of Tom Mboya, Pio Gama Pinto, and JM Kariuki, or in South Africa with the assassination of Chris Hani and, more recently, of members of NUMSA and Abahlali base Mjondolo. Thomas Sankara was assassinated in 1987 by his comrades in Burkina Faso, after attempting radical pro-poor reform. ‘African Socialism’ was fêted as the answer to the continent’s underdevelopment in the early post -independence years, but in every case, this was combined with the requirement that there be only one legitimate party. Whatever the actual political colour of the regimes, it was not uncommon for nationalists to proclaim an allegiance to socialism, albeit to an ‘African’ version. Kwame Nkrumah was perhaps the most radical of the nationalists, but even in Ghana, no attempt was made to dismantle the colonial state. As a result, radicalisation spread amongst the population. In 1961, railway workers organised a national strike, but the state became increasingly authoritarian and independent political organisation was repressed, until eventually a one-party state was declared. Nkrumah’s political writings became much more radical after the coup d’état that overthrew him in 1966. Similarly, Julius Nyerere established his own particular brand of socialism–Ujamaa–in the aftermath of the revolution in Zanzibar, in which he orchestrated the repression of Abdulrahman Babu’s Umma Party. Nyerere’s Arusha Declaration declared a one-party state, preventing the independent organisation of left, working class organisations. A once ardent trade unionist, Ahmed Sékou Touré led Guinea to independence in 1958, and in 1960, declared his party, Parti démocratique de Guinée, the only legitimate party. The combination of repressive one-party states that proclaim themselves ‘socialist,’ the establishment of Stalinism in the Soviet Union with its own form of repression and one-partyism, and its final demise in the collapse of the Berlin Wall; all these have contributed to the discrediting of the idea of ‘socialism’ as a progressive force. In many African countries, the word ‘socialism’ is a dirty word that has been lost in every-day vocabulary. The struggle of man against power is the struggle of memory against forgetting. There remains today the challenge of building strong left, working class movements. Whatever the constraints that we may have inherited from our history, the reality is that after independence our national bourgeoisies have failed to deliver on their promises. Thirty years (or some twenty years in the case of South Africa) of neoliberal policies willingly imposed by this class have resulted in conditions for the majority that are in many ways worse than they were at independence. Today discontent is growing, especially among the youth. But there is also a more widespread disenchantment with postcolonial governments that derives from their loss of credibility and legitimacy. Serious questions are increasingly being raised concerning the ability of this class to lead the way to emancipation. The objective conditions offer, at least potentially, good conditions for building a left movement. But that cannot be done on the basis of the forty-year-old analysis of the nature of capitalism and imperialism to which much of the left has become accustomed. There is work to be done in deepening our understanding of the changes that have occurred in both the nature of today’s financialised capital and its operation in the ‘peripheries.’ Such an analysis is necessary if we are to appreciate the fact that the workplace is not the only site where accumulation by dispossession occurs: it also occurs through the extraction of income and wealth through rents, the privatisation of health and social welfare, education, land, water, power, etc. All of these are subject to speculation. Firoze Manji is Director of Pan-African Baraza in Nairobi, Kenya. This article was previously published by International Viewpoint. I am surprised to find my paper reproduced here without any prior indication that you would be doing so. This was posted at the same time as David Seddon’s so-called ‘rejoinder’. I would not normally be comfortable about being associated with this journal / website, and resent the fact that the paper is appropriated here merely to justify publishing Seddon’s rant. I will respond to the latter in due course, but will need to reflect on whether ROAPE is the appropriate place to do so. Zellig approached me to write something for ROAPE, but I had not yet decided whether I would do so. Common courtesy would have required letting me know before reproducing this together with Sedan’s piece, especially as the only justification for reposting an article that is more than a year old and which first appeared in Amandla (who are not even acknowledged as the original source) is to allow Seddon to have his piece published here. I apologise for not requesting permission, but as your piece has appeared – reproduced – on various sites I did not think you would mind. I would be more than happy to either remove your post and/or publish your response. I had not heard from an earlier email. I would welcome a robust defense of your original piece. I am very sorry if my ‘rejoinder’, published here together with the original piece by Firoze Manji (which was published some time ago in several places, including in Amandla) has given offence. There was no intention on my part to do so, and in fact I did inform Firoze that I had written a ‘rejoinder’ and offered to send it to him by e mail and also provided him with the link to RoAPE. My concern is to make a contribution to the on going debate on class struggle in Africa (as I have been doing for some years now), not ‘rant’ – although as E P Thompson observed, ‘ranting’ is a historically well documented mode of presenting an argument in the English radical tradition (eg The Ranters).